Space missions are today producing a huge volume of scientific data in the fields of Earth Observation, Astronomy and Planetary Exploration. 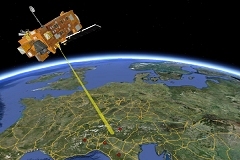 A smart way to meet increased mission needs, both in data management (available mass memory) and in data transmission (bandwidth), is moving data processing from the ground segment to space, developing ad-hoc On-board Payload Data Processing capabilities, looking at automatic data selection (based on features) and autonomous tasking. The Space Payload Data Processing system, in short spacePDP is a structured framework intended to ease the development of such capabilities. spacePDP is composed of independent hardware and software modules and completed by a specifically designed IDE (Integrated Development Environment), including a user GUI (Graphical User Interface). spacePDP has been used in different operational conditions, both for SW (RTEMS and VxWorks) and HW (LEON2 and 3, DSP, ARM). spacePDP is well suited to provide mission’s standard tasks (e.g. TM/TC, sensors control, mass memory management, uplink and downlink), and makes possible a straightforward implementation of mission specific tasks as scientific data processing. The system fits both on satellite platforms and on planetary exploration rovers. sPDP is currently used for the scientific data processing and compression in the Solar Wind Analyser instrument suite on-board of Solar Orbiter and in the development of OP3C, a novel hyper-spectral data cubes compression module. The SW architecture is characterized by flexible and customizable building blocks to be easily integrated in customized mission applications. New development tasks are facilitated thanks to the integrated development framework, able to access HW resources and transfer the compiled objects to the target HW, manage the toolchain and execute/debug the SW on-board from a single interface, with a GUI based on Eclipse RCP. The SW layer of the whole system is composed by an SDK (including an IDE and a development framework) and the target OBSW application. ANN based algorithms for data compression and features extraction have been tested and validated on the spacePDP framework, implementing computational models in a multi-layer perceptron configuration. An ANN consists of multiple computing nodes each corresponding to a simple mathematical model of a biological neuron that performs a linear combination of its inputs followed by a non-linear logistic sigmoid function. Nodes are organized in a few layers and each node is connected to all the others in the next layer with a weight representing its relevance in the model and a cut-in threshold. Weights and thresholds are automatically “learned” using training datasets in an iterative process.